This lovely photo of a Mathis is clearly worthy of an SAHB Snapshot, but we are ashamed to admit that we cannot identify the model. Nevertheless., researching the photo did give us an insight into the history of the Mathis company, and possible candidates for the model and date. The right hand drive is not unusual. Virtually all the pre-war Mathis cars appear to be thus. The main number plate is uncertain – perhaps someone can help us with this. It might be French. The lower number is almost certainly Swiss – with their flag on the left and the Zurich canton shield on the right. This makes sense: on the reverse of the photo is the stamp of the photographer: J Gaberell of Thalwil in the canton of Zurich. The most informative clue is the radiator. All the radiators for 6-cylinder Mathis cars of the vintage period have SIX in large letters under the Mathis logo, so this is a four-cylinder car. But which one? 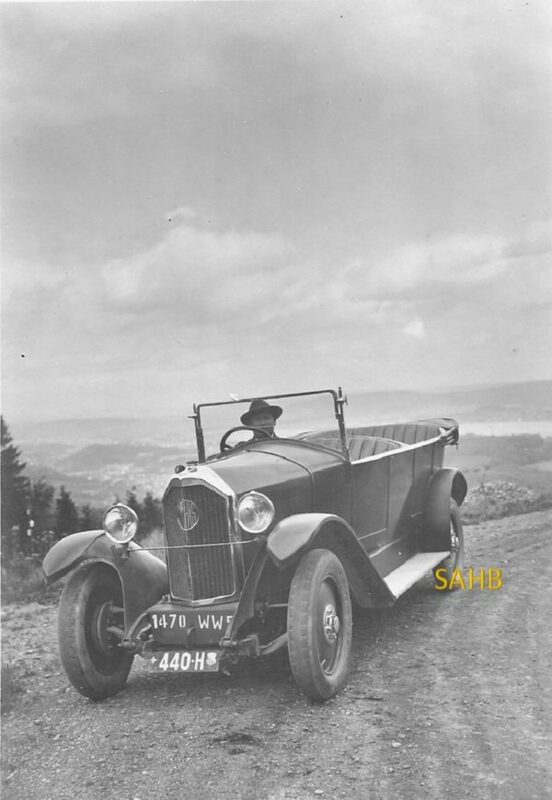 From the end of 1921 the first low-chassis sports versions of the SB appeared with a coupe-vent or vee-shaped radiator – which we can see in our picture. All models up to 1927 had this feature, at least on luxury or long wheelbase versions. Émile Ernest Charles Mathis was born in 1880, and started a company for the sale and repair of motor cars around the turn of the century. Two models were designed for him by the young Ettore Bugatti, which were marketed under the brand Hermès from 1904 to 1905. The first “true” Mathis model was launched in 1910, followed by the more successful small Babylette and Baby models just before World War I. After the war, the firm became No. 4 in France, making more than 20,000 cars in 1927. The Depression of 1929 led to a rapid decline in the fortunes of Mathis, but from 1939 Mathis and Ford of France entered into a joint venture to produce the Ford-based Matford until 1939. After World War II the company was not one of the automakers included in the Pons Plan, and ended its life making engines for light aircraft and components for Renault. The Mathis company closed in 1950. So we have here a vintage 4-cylinder Mathis, almost certainly built between 1921 and 1927. Can anybody tell us more?